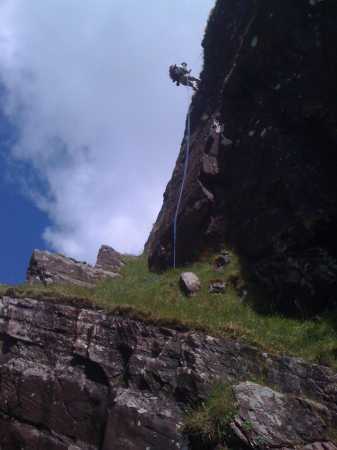 Picture from sbender : second abseil. On Sunday the15th of August we (Tim, Radu and myself) decided to climb Brandon. As it was Tim's last Irish 'Munroe', we thought to mark the occasion by going via the Faha Ridge. To make it even more interesting we planned on sticking to the ridge proper. We started as usual at the grotto, the long slog up to point 822. After that it became interesting. the ground and the rocks were damp and slippery as it was still early in the morning. After a very scary slip by Radu, we decided to rope up. It was an easy scramble down...only very slippery! we soon came to our first abseil, the cliff just above the flat knife edge, approx. 15m. You'll need a 2.4m 'sacificial' sling here, good protection. After negotiating the flat knife edge, we came to our second abseil, approx. 15m. A second sacrifical sling is needed here this time 1.2m is enough. after this it was across a small boulder field and up to the steep ridge that leads to Brandon North peak. this is a grade 2 scramble with first a vdiff. move, which can be done without protection. The rest of the team was brought up on belay. The second move is graded severe, which can be easily protected with some cams (nr 4-5). Unfortunately we forgot to bring them, as we didn't anticipate that kind of climbing, so we had to bypass this (to the right). Got back on the ridge after that which is basically a very steep scrabmble. Its advisable to stay roped up untill it levels out near the top, as it is very steep and wet.